« Fall Colors are Starting in Maine! Today we had the exceptional opportunity to join together (at least for a few hours) two Maine bed and breakfasts with similar names, and related histories. As many of our guests will know from our history of the Brewster family, Jarvis Brewster, who built the house in 1888, was descended from William Brewster, who arrived in 1620 on the Mayflower, and whose descendants migrated to Maine thereafter. The year 1888 also was the year of birth of another Brewster descendant, Ralph Owen Brewster, of Maine. Owen (as he was known) was Governor of Maine and later a U.S. Senator. His disputes with Howard Hughes were shown in the film, The Aviator. 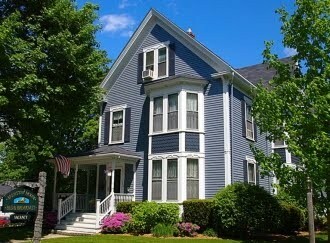 Owen’s home in Dexter, Maine, is also a Bed and Breakfast today, known as the Brewster Inn. Mark Stephens, who, with his wife Judith, owns the Brewster Inn, spent a night with us while in the area for business commitments this week. We enjoyed Mark’s brief visit, exchanging innkeeping ideas and discussing the possibility of working together on a history package, emphasizing the Brewster family and its Mayflower connections. The Brewster Inn is located in Dexter, the Maine Highlands region, about an hour and forty minutes drive north and west of Brewster House Bed & Breakfast in Freeport.